The Columbia River Model Railroad Club occupies the 4,200 square foot building at the corner of N Vancouver Avenue and N Russell Street. With miniature portrayals of life in the 1950’s along the Columbia and Willamette Rivers as well as towns that extend north, south, east and west of the rivers, a person can step into a wonderland of historic replicas and imagination. Visitors can see this amazing 60 by 70 foot layout with a working replica of the Steel bridge, the Union Station and Albina Yards, Mount Hood in its glory at sunrise, and even some fun additions like a partially cloaked Klingon Battle Cruiser and a triceratops tagging along with the zoo animal parade. According to Steve Watkins, one of the club’s members and our tour guide, the Broadway Bridge that is displayed is actually etched brass that was sent over to England with a photograph of the bridge railing and then replicated and returned to Portland. “The bridge took 3,000 hours to complete copying all the stairs and cross supports. Union Station took 500 hours to complete,” says Watkins. Scenic license is used to do what they can to make the display accurate while adding some imaginative scenes and creative details. The architectural modelers who designed the layout had a big influence on the details included. For example, one modeler remembered going to school in Oregon while living in Washington and having to take the Lyle Ferry to school every morning and then come back again at night. Recalling all the details, she built a replica of that ferry crossing. 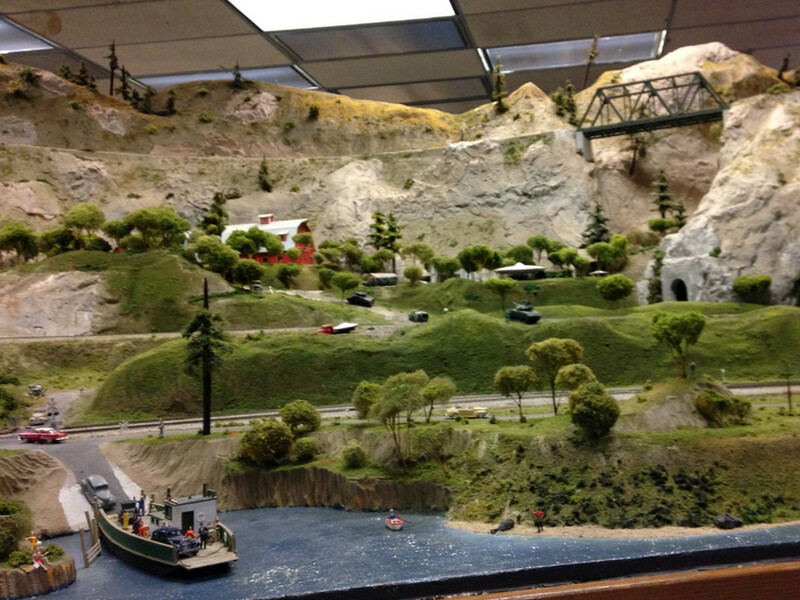 The Columbia Gorge Model Railroad Club is one the oldest clubs in the country. It was founded in 1947 and was located in the basement of a building which is now a vacant lot but within sight of the present location. After losing its lease, the club’s next location was constructed by its members on a vacant lot on N Montana Avenue in 1948. It remained the clubs permanent home for 34 years. In 1982 they sold that building and built the current location moving in on January 1, 1983. The layout now is substantially finished but the club is continually adding more details and better representations. The close to 100 members of the club come from a wide range of trades and professions. Some create scenery, others work on the tracks and electronics and still others help with the computer programming. New members are always welcome and membership offers fellowship, operating fun, modeling opportunities and a chance to learn all phases of the model railroad hobby. Words cannot describe the amazing world that has been created inside. However, everyone is welcome from 10am-5pm Saturday and Sunday for only $7 or $15 for special behind the scene tours each weekend in November. Don’t miss your opportunity to view this west coast wonder and maybe even give the scavenger hunt a try with 15 fun items for kids (or adults) to search for within the exhibit.